if you use your iPhone in your business ! and If you have sensitive or confidential information on your phone, or if you want to avoid digital joyrides that run up massive roaming or data charges, you need to truly lock your iPhone 3G. You can add an extra passcode to your iPhone that must be entered before anyone can use it. 1. On the Home screen, click Settings. The Settings application appears. 2. Tap General. The General screen appears. 3. Tap Passcode Lock. The Set Passcode screen appears,. 4. Tap your four-digit passcode. For security, the numbers appear in the Enter a passcode box as dots.When you finish, iPhone 3G prompts you to reenter the passcode. 5. Tap your four-digit passcode again. Turn Passcode Off. If you want to stop using your passcode, tap this button, and then enter the passcode (for security; otherwise an interloper could just shut off the passcode). Require Passcode. This setting determines how much time elapses before the iPhone 3G locks the phone and requests the passcode.The default setting is Immediately, which means you see the Enter Passcode screen , as soon as you finish dragging Slide to Unlock.The other options are After 1 minute,After 5 minutes,After 15 minutes, After 1 hour, and After 4 hours.Use one of these settings if you want to be able to work with your iPhone 3G for a bit before getting locked out. For example, the After 1 minute option is good if you need to quickly check e-mail without having to enter your password. Show SMS Preview. When this setting in On, iPhone 3G still displays a preview of an incoming SMS text message when it’s locked; if you prefer not to show SMS text message previews when iPhone 3G is locked, change this setting to Off. With the passcode activated, when you bring the iPhone 3G out of standby, you drag the Slide to Unlock slider as usual, and then the Enter Passcode screen appears. 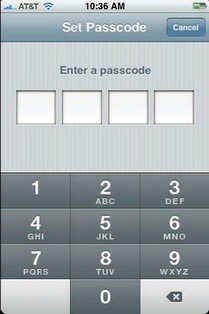 Type your passcode to unlock the iPhone 3G.